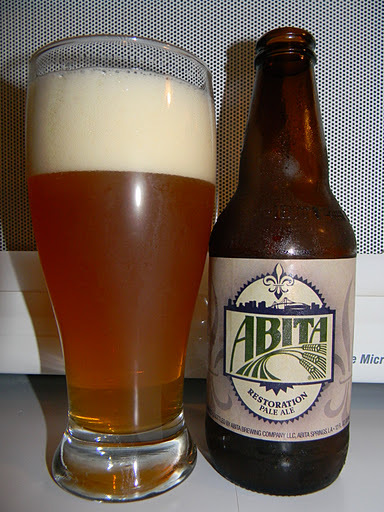 Abita | Beer Apprentice - Craft Beer News, Reviews, Interviews and Info. Hi guys. How’s everyone doing? Well I hope. For today’s craft beer review I’m going to be trying the Abita 25th Anniversary Vanilla Double Dog produced by the Abita Brewing Company situated in Abita Springs, Louisiana. It’s been forever since I last had an Abita brew, so when I saw this “special” brew I figured I’d pick it up and give it a go. From the website, abita.com, I found this bit of info regarding this anniversary beer. Alrighty then. Let’s get it poured. This beverage came in a 22 oz. bomber and it had an ABV of 7.0%. It poured a dark brown to a very dark black cherry to ruby color. The head was an off white/eggshell color. It was smooth and somewhat creamy. The size was commendable, yet the retention time and the lacing were only “so-so”. Both seemed to fall back into the liquid fairly quickly. The nose released heavy hints of wheat bread. A slight toastiness and maybe even a touch of hazelnut was discovered as well. A bit of chocolate was found, however I didn’t stumble upon much vanilla to be honest. It did smell quite earthy and round though. Overall, not a bad aroma. The flavor was rather nutty and toasted. The vanilla was a tad more forthcoming in taste than it was in the aroma. It still wasn’t overly aggressive though. Again, a bit of chocolate was discovered and maybe even a dollop of caramel too. Also, the breadiness seemed to remain consistent with the bouquet. The mouthfeel was medium bodied. Smooth, sort of dry and slick. The carbonation was of medium strength and I found no heat or warmth from the 7.0% ABV. A decent amount of character was left behind on the palate for me to enjoy between sips. Well, this beer wasn’t bad. It wasn’t the best I’ve ever had, but it was respectable. I think it would be a pretty nice beer for the Fall season because of the toasty and nutty aspects. I was hoping for a bit more vanilla, but…. oh well. It was what it was. It was fairly easy to drink and I wouldn’t have a problem drinking it again if it were offered. It would be worth a try if you were to see it on the shelf, however I don’t necessarily think that I would go out of my way to obtain a bottle. 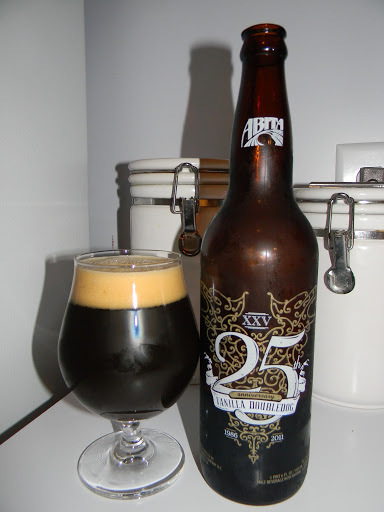 So, with that being said, pick up a bottle of the Abita 25th Anniversary Vanilla Double Dog and give it a try. You may really enjoy it. Be sure to leave a comment if you wish and tell me of your opinion. Thanks for reading everyone. I’m grateful for all of the interaction. For today’s craft beer review I thought I would try my hand at tasting the Abita Turbodog produced by the Abita Brewing Company located in Abita Springs, Louisiana. I’m steadily working my way through most of the Abita brews, however I’ve never tried the Turbodog, so I figured I better give it a whirl. From the website, abita.com, we find this description. Sounds pretty good. Let’s try it. This brew comes in a 12 oz. bottle and, according to the website, it has an ABV of 5.6%. It poured a dark ruby to brown color with some brighter ruby highlights showing at the bottom and edges of the glass. It had a very small, somewhat creamy and smooth tan head. The retention time was minimal and the lacing was sub-par. The nose revealed some decent roasted malts with a significant amount of nuttiness. Something similar to walnuts and hickory nuts. Some caramel and toffee sweetness along with light hints of chocolate and very, very light hints of molasses made for a decent smelling fragrance. I also noticed a slight “woody” tone hiding just underneath the previously mentioned aromas. The taste provided a bit more of the toasted nuttiness as well as some hints of freshly baked wheat bread. The chocolate and caramel seemed to come on a bit stronger in the taste than did the aroma also. Just a touch of bitterness was noticed, however I found a strong hint of grain as the brew began to warm. All in all, not bad, although nothing extraordinary either. The mouthfeel was medium bodied, smooth, but not real dry. It had very little carbonation thus leading to a very flat mouthfeel. Only an average amount of flavor was left behind too. Well, this beer was alright I guess. It was just lacking a tad in a few of the categories. It wasn’t horrible or anything, however it wasn’t nearly as good as I thought it was going to be. It was still relatively easy to drink and I think it would make for a decent session brew, although after one, I wasn’t really craving another. It wouldn’t hurt to give it a try to see what your interpretation might be, but I don’t think I would go out of my way to find it. 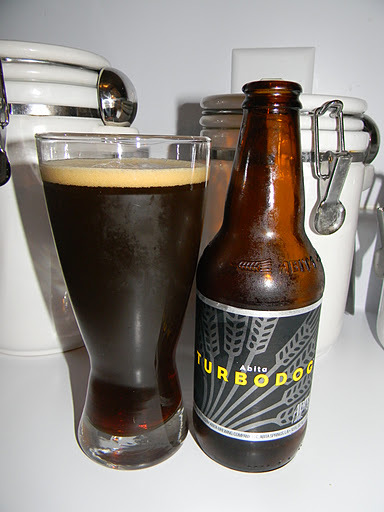 With that being said, I primarily think of the Abita Turbodog to be mostly average to slightly above average. For today’s craft beer review I’m going to be sampling the Abita Restoration Pale Ale, which comes to us from the Abita Brewing Company located in Abita Springs, Louisiana. Like most, I really enjoy a good and solid Pale Ale, so I’m hoping this one doesn’t disappoint. Let’s read up on this beer from the website, abita.com. Restoration Pale Ale is made with Pale, Lager, Crystal and Cara Pils malted barley. It is liberally hopped and dry hopped with American Cascade and fermented with California Ale yeast. The end result is a brilliant gold ale with a rich body, mild bitterness and a snappy fresh citrus hop flavor and aroma. Ok. Let’s give it a pour, smell and taste. This brew has an ABV of 5.0% and it comes in a 12 oz. bottle. The Restoration Pale Ale poured a pale orange to amber color with some burnt orange and yellow highlights shimmering around the edges. It looked quite hazy with a bit of sediment floating throughout. The cap was off white, soft and fluffy. It was nicely sized with a pretty good retention time and adequate lacing. Not bad at all on the appearance. The aroma began with some sweet smelling caramel malts. It also seemed to have a distinction of slightly toasted breads and butter. Very light hints of fruit along the lines of mild peaches and apples. The bouquet seemed to be balanced fairly well, however it was nothing too strong or pungent. Rather relaxed and easy going. The taste was similar to the aroma in that the caramel malts, toasted breads and butter came through first. As I dug a bit deeper, I started to noticed a hint or two of grain and maybe some grassy hops. Very light peach notes added just a touch more sweetness. Once again, I thought it was well balanced and even, although still just a bit on the mild side. The mouthfeel was medium to medium/thin. A touch watery, but smooth and crisp with a little bit of snap. Could be relatively refreshing during the warmer months for sure. Not a whole lot of flavor was left behind on the palate though. Well, this beer is ok. It’s easily drinkable and would make for a great session brew. It’s not too robust or overly complex, but it still has enough flavor and character to make for a pretty enjoyable drinking experience. To tell the truth, it reminded me quite a bit of an English Pale Ale or an ESB. I would have no problem drinking another. I also think that this could be a brew to have around when serving dinner to a bunch of friends. It’s not the world’s greatest Pale Ale, but it is a solid beer that one wouldn’t have to think about too much while enjoying a good meal. Have you guys ever tried the Abita Restoration Pale Ale? If so, what did you think of it?